In addition to desktop PCs, we buy laptops and other types of mobile devices which are considered to be scaled-down versions of computers that don’t require being plugged in to an electrical outlet for a power source. What Made you Desire to Purchase Laptops as a Laptop Buyer? Laptops have become the computer of choice for a great many people in today’s busy world, just because of their mobility and flexibility, which makes them ideal for students at learning institutions, professionals who are constantly on the go in their daily jobs, and even household members who walk between rooms. What that all translates to is a great demand for laptops, because of their terrific versatility, and since they have that kind of appeal and value to such a broad swath of the population, it means we can resell those laptops to a potentially large audience of customers. In turn, that means we can be very flexible in working with you to provide you with the biggest payout for your laptop when you bring it into us, so you can use that extra money on anything you like. So, then, Out with the Old and in With The New? 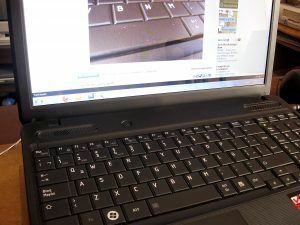 Maybe you have your eye on a new and improved laptop in the same model line, and you’d like to convert your current laptop into cash, so that you can use it toward buying that more powerful machine. That suits us just fine, because we can probably find a buyer for the machine you have now, and that means all parties involved are benefited, just by your decision to get rid of your old laptop. We do accept practically all models of laptop, and the better the brand-name, the more it will contribute to the payment amount we can give you – but you should also bring in all of the cabling and other accessories you have, so we would be able to sell it as a complete system. We are the laptop buyer in Mesa, Arizona that you should come to first when you have an older laptop that you’re ready to unload, and convert into cold hard cash. While we may be able to give you a quote over the phone, it’s always better if you can make the drive into our shop, so that our in-house expert can assess the true value of your machine, and give you the biggest possible payout for it. While we’re located in Mesa, Arizona, it will be easy for you to reach us if you are anywhere in the region surrounding Mesa, including Tempe, Scottsdale, Gilbert, Chandler, Apache Junction, or even Phoenix itself. What If I Don’t Want to Sell My Laptop? If you prefer not to sell your laptop outright to us, we may also be able to arrange a three-month loan as a pawn loan, so that you can enjoy the use of our payout money now, and eventually redeem your laptop computer when the loan period has expired, and you have completely paid off the loan. Whichever is more convenient for you, we will be happy to work with you to make convenient terms that will be the most advantageous for you.